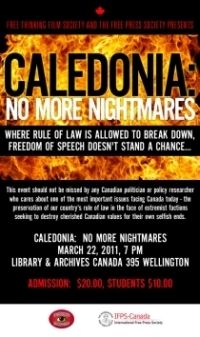 Something changed in Caledonia yesterday. 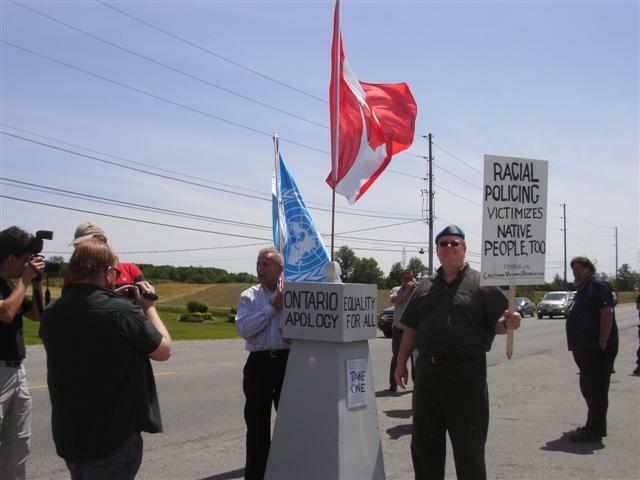 In a way never before seen in the history of the Caledonia crisis both the OPP and the occupiers of the Douglas Creek Estates displayed respect for the rights of non-natives at yesterday’s CANACE/Caledonia Victims Project Truth & Reconciliation Rally yesterday, and that respect resulted in us being able to place our symbolic Apology/Reconciliation monument on the paved road-allowance portion of the entrance to DCE while we made some short speeches and answered questions from the media. The contrast between the conduct of the OPP and the occupiers yesterday compared to our Feb 27th and March 27th attempts to place our monument couldn’t have been more stark. During those attempts the OPP stood by as occupiers bumped, assaulted, and screamed insults at us from inches away, and falsely accused us of assault. During the March rally officers watched as our monument was stolen from us by occupiers, destroyed and then burnt with our Canadian flag. Yesterday’s event, however, was nothing short of remarkable. We held a BBQ at the farm of Ernie Palmer at the south end of Caledonia with free hotdogs and drinks from 12-2pm. We were joined by members of a Jewish group, some of whom have read Helpless and are concerned about both the existence of racial policing and the involvement of anti-Israel groups in the Caledonia crisis. Toronto blogger ‘Blogwrath’ made the trip to Caledonia with his wife, as did the VP of the International Free Press Society in Canada Mary Lou Ambrogio, and Director of Communications Al Gretzky. 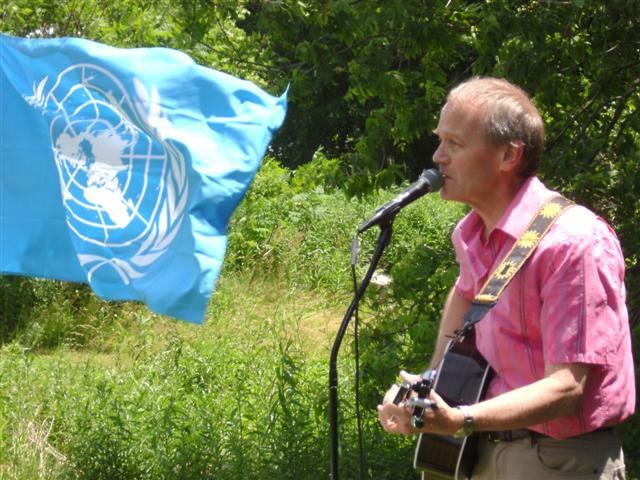 Live entertainment was provided by world-class musician Stuart Laughton, a founding member of Canadian Brass [LINK], founder of the Porkbelly Futures roots-rock band [LINK], and the Artistic Director for The Forest Festival in Haliburton [LINK]. He sang a great selection of blues songs until it was time to leave for the occupation site. Our crowd stayed on the grassy side of the entrance (closest to the church) while we spoke, facing away from the occupiers. I spoke first, followed by Merlyn Kinrade, then IFPS Communications Director Al Gretzky, and finally, Gary McHale. 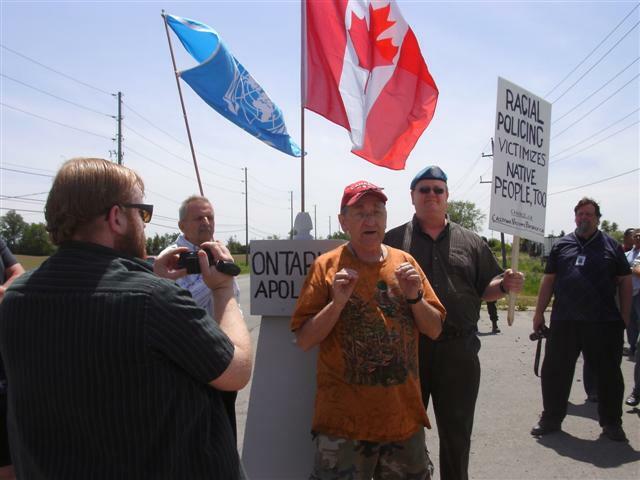 First, I turned and thanked the occupiers – approximately 25 feet behind me – for respecting our right to place our monument that calls for apologies from Six Nations, the OPP and Ontario government. The occupiers remained nearly silent as we spoke. One occupier made a loud comment (which I did not catch) to which his female companion reminded him to be quiet. It was stunning, it was completely unexpected and it was appreciated. Al Gretzky, Director of Communications for the Canadian chapter of the International Free Press Society briefly recounted his experience at the Feb 27th rally about which he said at the time, “I didn’t think I was in Canada.” Gretzky said that someone asked him if yesterday was ‘the end’ to which he responded, no – he thought it was just the beginning. We left with our monument within 10 mins and returned to the site of our pre-rally Father’s Day BBQ at Ernie Palmer’s farm. Two plainclothed OPP officers stopped by for a post-event discussion, so I was able to thank them for what they had helped to accomplish. They couldn’t divulge details, but made it clear they had invested a great deal of effort and stress to help bring about the day’s unexpectedly-good result. One officer kindly expressed his appreciation that I had recognized the respect shown us by the occupiers in my remarks. 1. The OPP made a decision to work to protect the rights of non-natives after five years of evading that responsibility. They met with us on several occasions to try to understand our position. We are not privy to what was said by them to the occupiers, but clearly, the OPP worked hard behind the scenes to convince the occupiers that we had the right to be there, that they could not stop us, and that they had an obligation to protect us from violence and intimidation. There was a strong OPP presence with numerous vehicles scattered at strategic locations around Caledonia – not to stop us from excercising our rights, but to protect them. All of this represents a significant change in attitude. 2. The occupiers seem to have realized that trying to stop non-natives from exercising their rights via violence and intimidation is not in their best interests. But, it was more than that: not only did they not attempt to stop us from placing our monument, they showed great restraint by not trying to shout us down which they could have easily done. No one, including the police, could have stopped them from heckling us, but they chose to act with dignity instead. The statement by Floyd Montour (who, with wife Ruby, was a leader in previous occupations) to Moose FM’s Wendy Gray about realizing that our fight wasn’t with them, but with the OPP, was simply remarkable. 1. 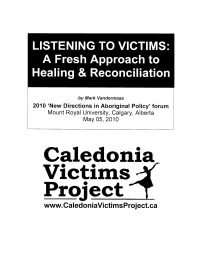 During our discussions with the OPP Gary informed them that we had several members from a Jewish advocacy group coming to participate along with the two executives from IFPS-Canada, who had both attended our Feb 27th Truth & Reconciliation rally. These connections, and others we are working on, are bringing more scrutiny, awareness and unity on the issues that is likely making it more difficult for politicians and police brass to ignore. 2. 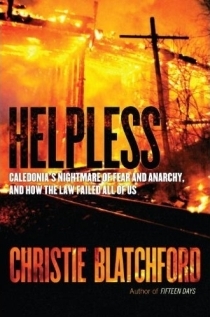 Christie Blatchford’s book Helpless. 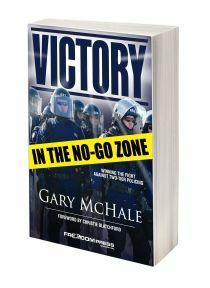 Although the current OPP Commissioner, the current Haldimand detachment commander have not read the book, they surely know the truth about racial policing cannot be denied forever, especially if the Conservatives win the next election and an inquiry is called. 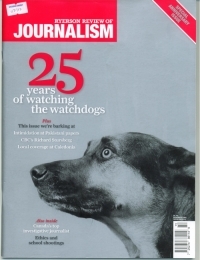 Page 32 of their ‘Changebook‘ talks about toughening rules on illegal occupations, so the writing is on the wall. There will be a day of reckoning, and it surely is better for everyone if the OPP begin the process of reform sooner than later. 3. Christie Blatchford’s recent article about the charge of Assault against Gary McHale in which she compared the justice system in Haldimand County with that of the U.S. Deep South. It was a shocking indictment of the OPP which may well have led to the Crown’s decision to drop the ill-advised charge. 4. Six Nations Councillor Helen Miller’s recent – and stunning – letter to the Turtle Island News in which she itemized Six Nations’ dysfunctionality and said it was time to stop blaming white people for their problems. 5. 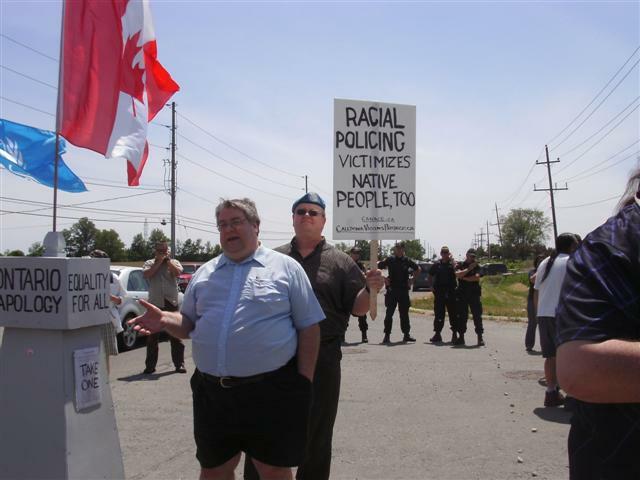 We know that the CUPE 3903 coalition of radical unionists, anarchists and anti-Israel groups who have been egging on native militants since 2006 are very concerned that their tactic of smearing us as white supremacists has been a complete disaster for them, that they have not been able to counter our application of Dr. King’s teachings; and that our adherence to those teachings has actually caused the public to see them as the racists, and not us. 6. Gary McHale has announced his intention to lay charges against members of CUPE 3903’s First Nations Solidarity Working Group after they entered private property on Feb 27th to confront us and prevent us from using it. McHale has extensive success in using the private prosecution provisions of the Criminal Code to have courts issue process for charges against OPP officers and native protesters, so the promise of charges being filed is not an empty one. 7. The video and related photos of the DCE occupiers destroying and burning our first monument in front of OPP officers on March 27th had a strong impact in the eyes of journalists and the public in turning public opinion against the lawlessness and its appeasement. The use of violence and intimidation against peaceful non-natives asking for an apology to begin the healing process while refusing to respond to the provocations with angry words or violence, gives the occupiers and the people of Six Nations a black eye. It just isn’t a sustainable or winning tactic. Whatever the reasons for the changes, we welcome it from both the OPP and the occupiers. Both acted honourably yesterday, and we all – native and non-native – are better for it. Thanks to Officers Rankin and Goch of the OPP, and those we don’t know about behind the scenes. Thanks to Wendy Gray of Moose FM for driving a long way from home to relieve the local Moose reporter for the day to make sure the story was covered for Caledonia residents. Thanks to the CBC for sending a reporter for AM 860 (French); trying to locate a link to the story. Thanks to IFPS’s Mary Lou Ambrogio and Al Gretzky for making the drive from London, and ‘Blogwrath‘ for the drive from Toronto. Thanks to our new Jewish friends and their supporters. Shalom. Thanks to those whom we regularly count on for support – you know who you are. I’m so glad that everyone who stood with us yesterday got to be part of a Caledonia ‘good news’ story. It took 31 months and 4 arrests to make the Canadian flag legal again in Caledonia – across the street from DCE. It only took 4 months, 1 arrest and 1 destroyed monument to make it possible to ask for an apology at the entrance to DCE. In Caledonia, this is progress worth getting excited about. VoiceofCanada feature: THE END OF THE BEGINNING! For us, everything seems to have changed in an instant (after 5 years of struggle) and by that I don’t mean all of Caledonia’s problems are solved, but rather that perhaps we have the clearest sign yet that they will be solved, that there will be no more Caledonias so long as we do not give up the struggle, so long as we do not surrender our rights, so long as we continue to apply the wisdom of Dr. King to the best of our abilities. Al Gretzky said it best: yesterday was not the end, it was just the beginning – of something better. This entry was posted in Caledonia & Churches, Caledonia in The News, CUPE 3903, Doug Fleming, Events, Gary McHale, Jeff Parkinson, Mark Vandermaas, Merlyn Kinrade, Truth & Reconciliation, Truth & Reconciliation Events and tagged Al Gretzky, Blogwrath, International Free Press Society, Mary Lou Ambrogio, Stuart Laughton. Bookmark the permalink.